Photographs of our ancestors can be one of the most treasured traces they leave behind, often offering details of their age, status, relationships and more, as well as a glimpse into what kind of person they were. But, for those of us not versed in photographic history, family portraits can also be among the most difficult to analyse. In the current issue of Inside History (July-August), Jayne Shrimpton, a photography and dress expert and author, shares her top 10 tips for decoding family portraits. Below is her number one tip on unlocking the potential bounty of information contained within family portraits. 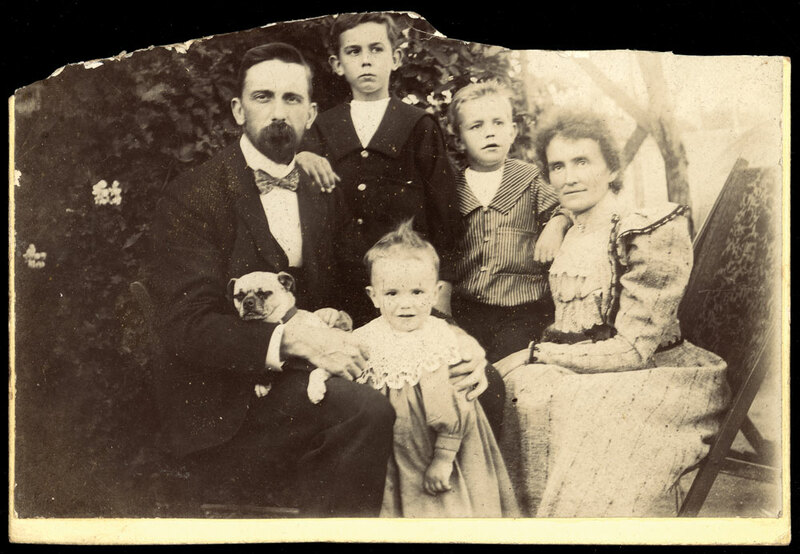 Unknown family posing for portrait, c.1890-1900. Courtesy State Library of Victoria, ID H93.62-37. Picture researchers don’t need to be experts in photographic history, but since different formats of images were produced at varying times, identifying the main types of photograph in a collection narrows down their date right from the outset. The first commercial photographic studios opened in 1841, so — take note — none of us are likely to possess family photographs dating from before then! Early studios produced daguerreotypes — one-off photographic images on a silvered copper plate that were usually presented in a folding case. They set the trend for portrait photography, yet were expensive, luxury pictures, so few families have daguerreotypes at home. The earliest known surviving Australian daguerreotype dates from 1845; they were virtually obsolete by the mid 1860s. In the early 1850s a new photograph appeared — the wet collodion positive or ambrotype. This was another unique image, the glass plate negative turned into an apparently positive image by blacking one side of the glass with lacquer. Usually framed or cased, glass ambrotypes were cheaper than daguerreotypes and by the mid 1850s were bringing photography to a wider population. However, studio ambrotypes were popular only briefly, as, like daguerreotypes, they were superseded by new photographic prints. Carte de visite card-mounted prints were first produced in Britain and Australia in 1859 and by the early to mid 1860s had become the most popular portrait photograph. The first mass-produced photographs, cartes de visite measure 10cm x 6.5cm and are easily identifiable from their size. They brought portraiture to the mass population and dominated 19th-century studio photography, becoming obsolete around the time of the Great War. Gradually, larger prints called cabinet cards became more fashionable. Measuring about 16.5cm x 11.5cm, cabinets began to vie with smaller cartes by the 1880s, becoming more popular during the 1890s and early 1900s. Millions of cartes de visite and cabinets survive in today’s family collections. A very different type of photograph was the tintype, or ferrotype, an image on a thin sheet of iron. First patented in America, tintypes were fashionable in Britain and Australia from the late 1870s onwards. Typically, they have a murky, metallic appearance and some appear as unmounted, sharp-edged metal images, while others are set into ornate frames or card mounts. Tintypes were especially popular with outdoor and travelling photographers: in Britain the last examples date from the 1940s. In 1902 the postcard with a divided back was first used for portrait photographs and eventually superseded traditional cartes de visite and cabinet prints. By about 1906 the postcard became the favourite photograph of the 1910s to 1930s, only disappearing after World War Two. Most families possess postcard photographs and visually they are extraordinarily diverse, ranging from studio portraits to outdoor scenes. Both professional photographers and some amateurs used postcard mounts. Amateur photography, once reserved for the wealthy, became popular during the early to mid 20th century. During the 1910s sales of personal cameras rose dramatically and between the wars many households acquired their first cameras. The rapid growth of snapshot photography is reflected in most family picture collections, for by the 1920s casual amateur photographs set outdoors were eclipsing professional studio shots, although occasionally individuals or families visited the photographer for special, superior portraits. A beloved personal portrait: this photograph depicts Jayne’s father, taken after D-Day. Courtesy Jayne Shrimpton. Read the other nine tips in issue 23 (July-August) of Inside History magazine. Click here for more. You can read more about Jayne’s book Tracing Your Ancestors Through Family Photographs (Pen & Sword, approx. A$26) here.